Drive down any street in a coastal community and even before you smell the salt water or notice sea gulls circling overhead, the boats in the driveways and side yards let you know residents are connected to the nearby waters. Thanks to the growth of SUNY Maritime College’s Waterfront Community Programs, the quiet Throggs Neck community – long disconnected from the much-maligned East River – is becoming one of these communities. And yes, this is the Bronx. On any given day, tucked underneath the Throggs Neck Bridge, where Long Island Sound meets the East River, folks who never even dreamed of sailing are getting out on the water. What started out as a way for SUNY Maritime students and professors to sail together has grown into a full-fledged US Sailing-recognized Community Sailing Center serving local residents, summer camp participants, and even nuns from the local monastery. On Tuesday and Thursday evenings from 5 to 8 pm through the end of this month, the public is invited to get out on the water. Participants can learn to sail, improve their skills, make new friends or just enjoy the scenery in a fun, relaxed atmosphere. No experience necessary. It is truly community sailing in that new sailors are matched with SUNY Maritime College Waterfront students, staff, or more experienced sailors in the program until they are comfortable sail a keelboat on their own. The community sailing fleet currently includes one of each of the most popular one-design keelboats including a Colgate 26, Sonar, and J/24. Sunfish and kayaks are also available. The program’s core audience is local residents who may have always wanted to try sailing or those that never thought it would be possible to try the sport right in their own backyard. From faculty and staff learning what many of their students already appreciate to local residents, camp participants and even nuns from the local monastery, Maritime’s Community Sailing programs attracts a diverse, enthusiastic audience. In addition to its community sailing program, SUNY Maritime College is capitalizing on its outstanding location and hands-on training expertise to offer Safety at Sea (in partnership with the Storm TrySail Foundation), Maritime Adventure Boat Camp (featuring sailing, powerboating, kayaking, SCUBA diving and marine science), Safe Powerboat Handling courses and the first United States Coast Guard Launch Tender course in the country requiring on-the-water skills. SUNY Maritime College’s enthusiasm for community sailing is catching too. Rocking the Boat, a local non-profit just down the river from Maritime in Hunts Point, is expanding its youth development programs to include a community sailing program that will provide opportunities to train 100 students. What does the future hold for Maritime’s community sailing and its other waterfront programs? SUNY Maritime is currently looking to expand its keelboats into a uniform fleet of at least six boats that will enable expansion of the community sailing and camp programs. Through the continued support of boat donors, the administration, alumni and of course the local residents it seems Maritime will continue to have a positive impact on the Throggs Neck community. SUNY Maritime College is the oldest and largest of the seven maritime academies in the nation. Founded in 1874 by the Marine Society of the City of New York, SUNY Maritime is a four-year college, which offers a solid academic program coupled with a structured cadet life in the regiment for both men and women, or a civilian program. Maritime offers undergraduate and graduate degrees with the option of either US Coast Guard license or intern programs, summer training cruises abroad, ROTC options, and 15 varsity athletic teams. The College is located at historic Fort Schuyler. Its beautiful 55-acre campus offers some of the best views of the New York skyline, the East River, and Long Island Sound. This year the College celebrates its 140th anniversary. 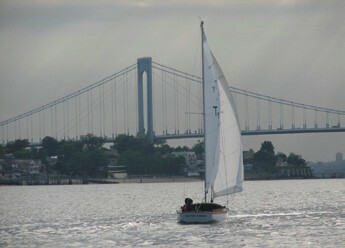 For more information about SUNY Maritime College’s Community Sailing or other waterfront programs, visit http://www.sunymaritime.edu/Waterfront/Programs/index or call 718-409-2447.